Are you facing PHP errors on your website? Want to downgrade/upgrade PHP Version for your website? Then you are in the right place. We will today show you how we can change PHP Version for Website in cPanel Hosting Server. Don’t own a cPanel Server? Head to our website https://www.basezap.com and get your Blazing fast cPanel Server in minutes today. Now, we will show you how you can change the PHP version for your Website in the cPanel account. Changing PHP Version from cPanel. 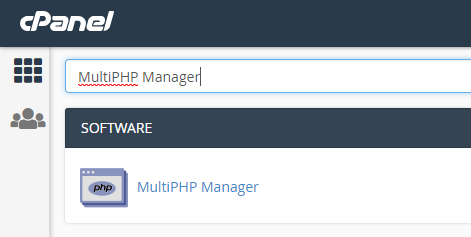 Search for MultiPHP Manager and open it. It will show you similar UI like the image below. It will also list all the domains hosted on the particular cPanel Account. Select the domain for which you want to change PHP Version using the checkbox in left. Select the PHP Version from the dropdown menu and tap on Apply Button. Checking PHP Version for your website. Create a file with any name in your home directory of the domain. We will use phpinfo.php for our file. Add the following line of code in the file and save it. Now we will open www.basezap.com/phpinfo.php to test the current PHP Version. It should show the PHP Info webpage with all the PHP variables and settings.